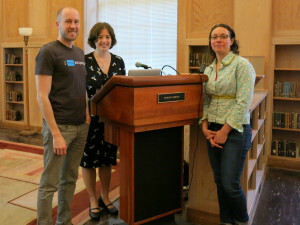 Wikipedia editor Jason Moore (left), Wiki Education Foundation Director of Programs LiAnna Davis (center) and University of Oregon librarian Annie Zeidman-Karpinski chat before Jason and LiAnna’s presentation on teaching with Wikipedia at the Knight Library on March 19, 2015. Wiki Ed staff have been traveling to California and Oregon university campuses recently, presenting workshops on using Wikipedia as a teaching tool to faculty and librarians. More than 100 people attended our workshops to hear more about Wikipedia and the learning potentials for students if they participate in our program. Hosted by libraries at the University of Oregon, Oregon State University, and University of California branches in Davis, Irvine, Los Angeles, and Riverside, these workshops help instructors who are interested in integrating Wikipedia assignments into their courses, either in the upcoming spring quarter or for summer or fall classes they are planning now. And they introduce librarians to ways that Wikipedia can be integrated into the higher education landscape. Professor Toby Higbie joined us at UCLA, and offered insight into his experiences teaching with Wikipedia. In Oregon, we were joined by volunteer editor Jason Moore, who presented information about Wikipedia from his position as an experienced contributor. These trips don’t just help university faculty and staff learn about Wikipedia, they also offer Wiki Ed staff the chance to have one-on-one conversations with librarians, instructors, and others about the trends they see in higher education. For example, we’ve started seeing more librarians enter university classes to teach media literacy modules. Wikipedia assignments can be a great way to teach media literacy, and learning about the issues facing higher ed helps us provide better assignment design resources for our program participants. Wiki Ed extends a big thank-you to our hosts. If you’re interested in a short version of the workshop, please watch our webinar.